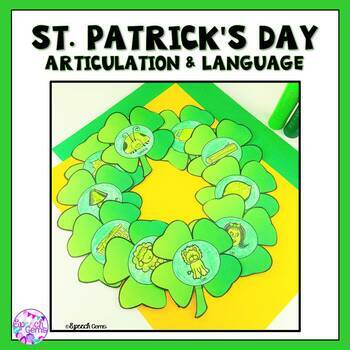 Create this festive Shamrock Wreath for St. Patrick's Day as you target articulation and language goals. Initial and final K, G, F, V, Sh, Ch, Th, R, S, L, blends, past tense verbs, plurals and pronouns (he, she, they) are included. This product includes both black and white copies as well as color. Print the wreath on card stock and cut it out. 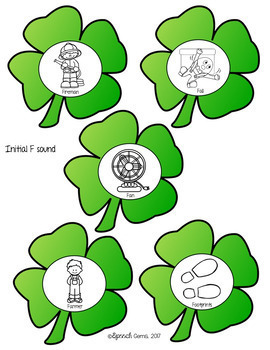 Select and print the shamrocks with the targeted sound or language skill you want to focus on. There is a color for your students that have difficulty coloring large areas. 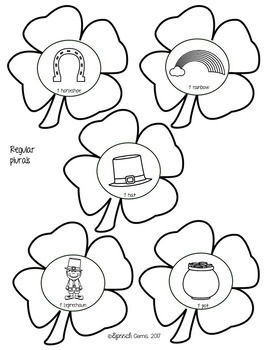 Practice the picture in the picture in the center of the shamrock and then color the picture. 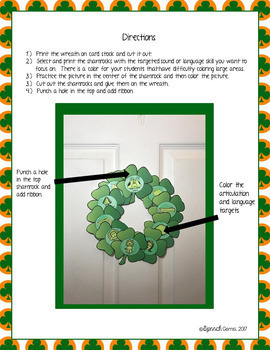 Cut out the shamrocks and glue them on the wreath. Punch a hole in the top and add ribbon. Send home for additional at home practice.